As I described when I launched this blog, I have a small galley kitchen. My condo building was built in the 1970s when there wasn’t as much thought put into gourmet-style kitchens. I have since renovated and got new cabinets that reach the ceiling and better utilize space, but I’m always looking for ways to make the space more attractive and functional. There is a support beam on one side of the kitchen that is part of the whole building, so I cannot alter it. 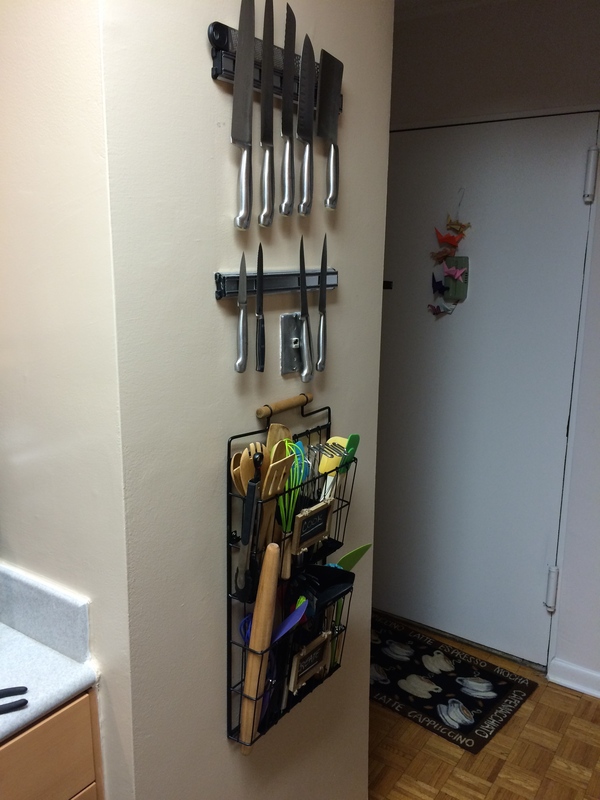 It is dead wall space and currently I have my magnetic knife racks on there. I decided I want to do more with the vertical space. 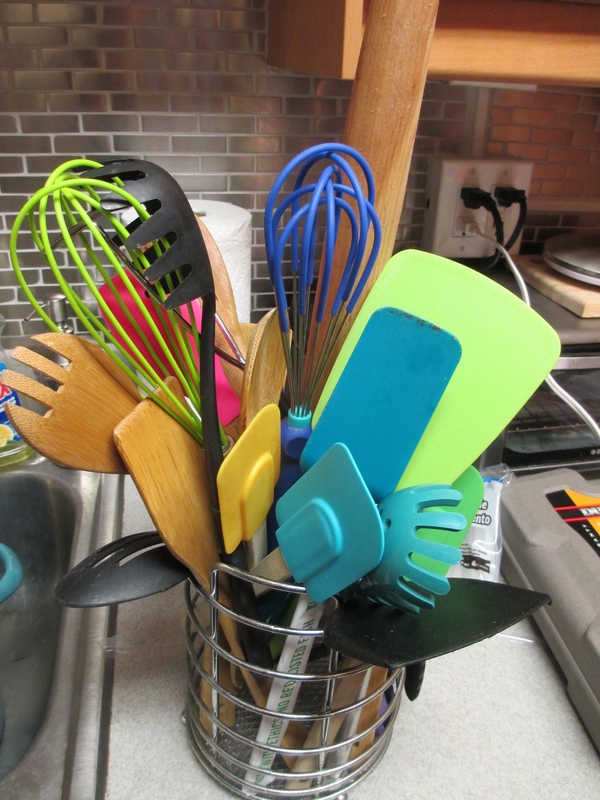 Since I cook so much, I have accumulated quite a collection of utensils and gadgets. Nothing too gimmicky, but enough that my current caddy was not doing doing it for me. 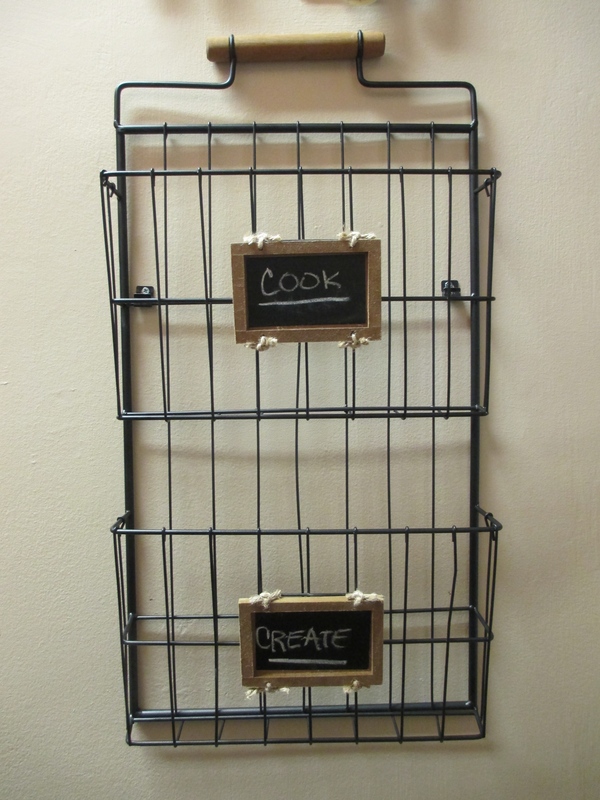 I was inspired by a grid-style system at The Container Store, but it would have required making sure there were holes or something to latch onto on each piece, and it may have ended up looking more cluttered, as not every piece matches or coordinates with each other. The other factor is that I do not want anything to protrude out too far and be obtrusive. 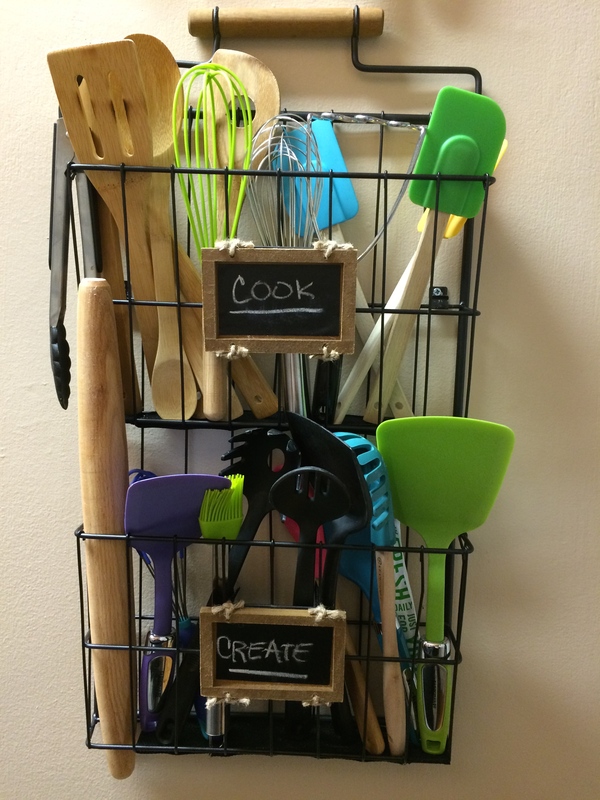 This was all looking fine and good, but the bottom of the rack had holes too wide for most utensils, and they still needed something to keep them from toppling over. I headed to Michael’s for inspiration. I had visions of metal mesh and soldering, but it may have been a bit too intense. 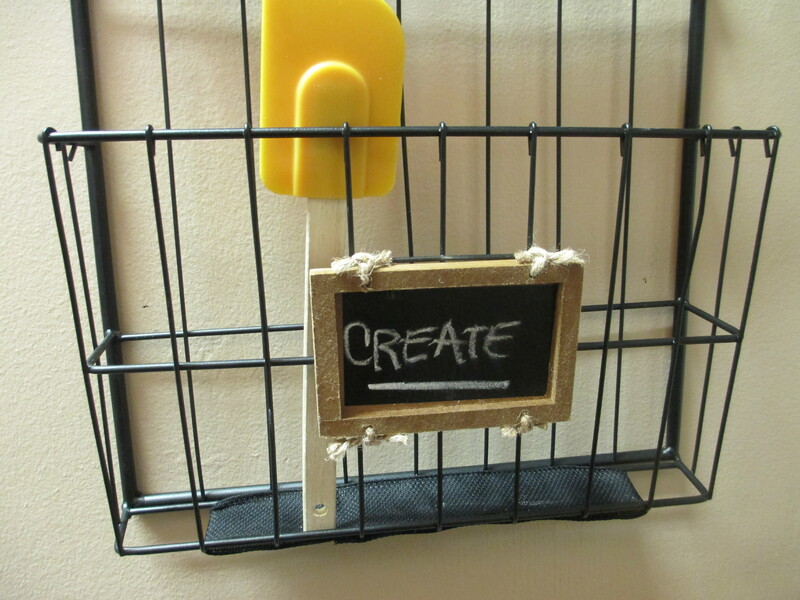 Instead, I found some nice black mesh ribbon that would complement the color and natural elements from the signs. Plus since it was ribbon, it would be cheap and easy to replace down the road if it gets dirty/worn. I soon got to work with ribbon and a glue gun. I threaded ribbon between the grooves to line the bottom and glued them secure. 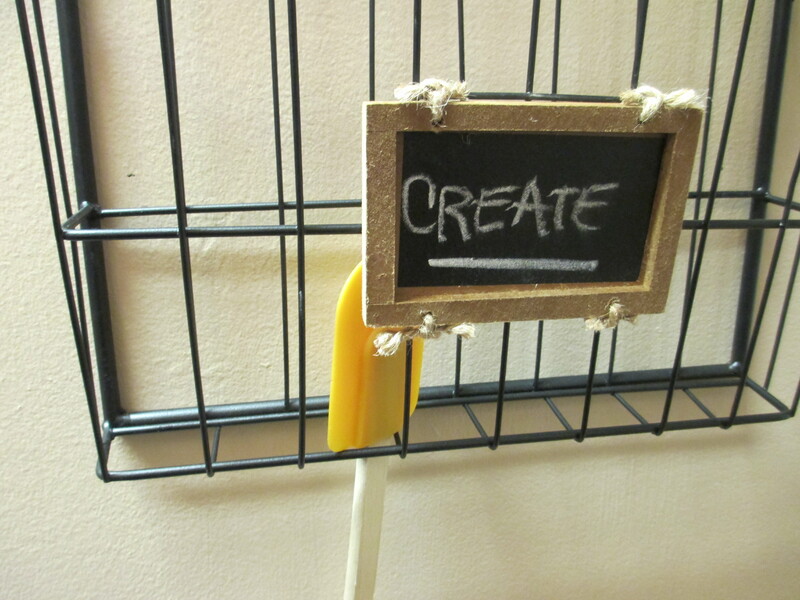 I also added a couple of ribbons between the signs to work as dividers so the utensils would not fall down. It’s not as pretty as having everything matchy-matchy, but that’s not really my style to be TOO coordinated, and it buys me more space for future gadgets. Plus I gained some counter space getting rid of the countertop caddy! Better use of the wall! 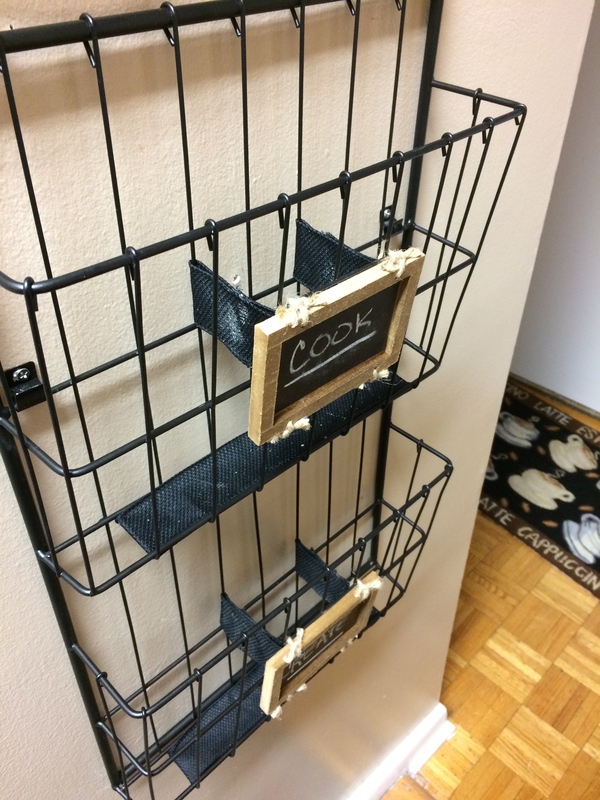 This entry was posted in chef's journal and tagged accidental chef, chef's journal, crafts, crafty, DIY, gadgets, projects, small kitchens, space saving, utensils by Anna Papoutsakis. Bookmark the permalink.